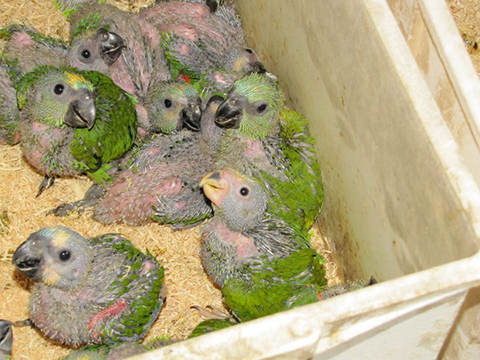 In early October, 305 Blue-fronted and Yellow-faced Amazon chicks, some less than 15 days old, were confiscated from wildlife traffickers in two separate incidents in Brazil. The Brazilian organization SOS FAUNA took on the task of helping these babies. After receiving emergency first aid from university students, they were sent to a government rescue centre (CRAS-MS) in Campo Grande in the state of Mato Grosso do Sul to recover. Sadly only 200 chicks survived and will be eventually released. 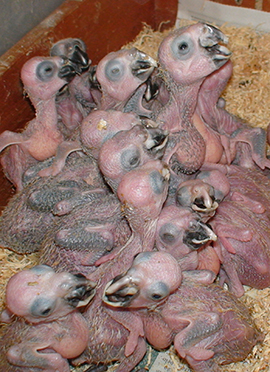 Through its FlyFree Programme the World Parrot Trust, along with several other local organizations, has also supplied funds for chick formula, syringes, gloves, and masks. 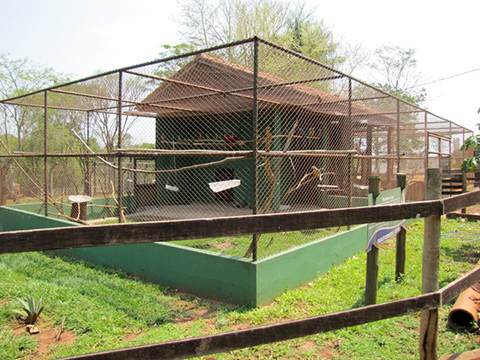 In early December, additional support was provided to build four flight aviaries, two of which are being built at a release site recently allocated by sympathetic landowners. These flights will be used to exercise the birds to prepare them for their eventual release, after an adjustment period, into the wild. Subsequent activities to confiscate additional chicks will also be supported. Local biologists believe Brazil’s Mato Grosso population of Blue-fronted Amazons to be under threat. The species has been heavily traded: since 1981 when it was listed on CITES Appendix II, 413,505 wild-caught individuals have been recorded in international trade (UNEP-WCMC CITES Trade Database, January 2005). The Yellow-faced Amazon is classified as near-threatened by the IUCN.